For review of all books in the Guild Hunter series: Go here. Recommendation: Definitely a pick if you like fantasy fiction involving vampires, archangels, angels and humans. 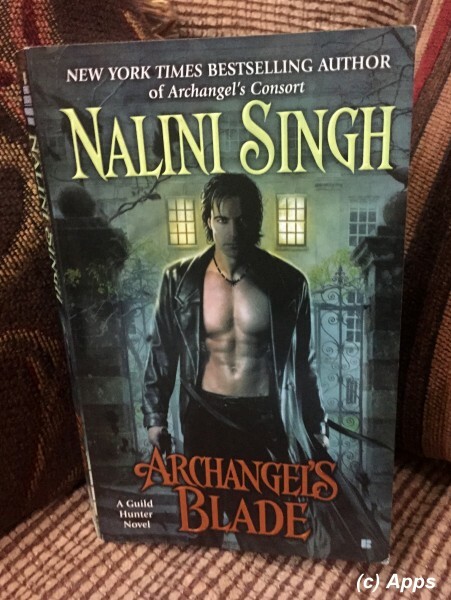 Angel's Blade is the fourth installment in the Guild Hunter Series by Nalini Singh published in September of 2011. The story plot revolves around Dmitri - a 1000 years old Vampire and Second-in command to Raphael - and Honor St. Nicholas - a Hunter of the Guild who was tortured by rogue vampires and a Guild Instructor. This book wrenched me heart for the pain that Dimitri goes thru all those 1000 years ago and what Honor goes thru now but then it lifted my spirits when they come out shining and totally in love. The stories in this series are set in a world where it is ruled by Archangels with Vampires, Angels and Humans with extra-ordinary powers as their team serving them. The Cadre that is the council of Archangels seats 10 powerful archangels who share the world in ten different continents and rule them, hold sway over the immortals and mortals alike. Archangels are immortals who have lived thousands and thousands of centuries. Angels are born or made but have lived centuries. Vampires are almost-immortals and are Made mostly and some have lived as long as the Archangels. They serve the Archangels and have contracts with their angelic masters that they have to live by. They use humans as cattle for feeding on blood. Guild Hunters are humans with special powers who are tasked to capture Vampires who have gone rogue. They have psychic and physical powers which are extra-ordinaire. Dmitri is the second-in command to Archangel Raphael and led The Seven - who were dedicated to Raphael to protect him in every way. With Raphael and Elena still in Japan monitoring his mother's activities after she has been risen, it fell onto Dmitri's shoulders when a severed head is found. Upon closer examination he finds some kind of tattoo high on the dead man's left cheekbone. Something in his memories stirred and recognized it but he could not capture that flicker wholly before it disappeared. Also the head belonged to a vampire who has been Made recently - identified due to his nascent fangs - and does not belong to Raphael's region. Dmitri reaches out to the Guild to get help of a consult - per protocol - and who can dig thru and find what the ink meant. That's how Honor St. Nicholas gets assigned to The Tower - from where Archangel Raphael rules with his Seven - to aid Dmitri in solving the case. Honor St. Nicholas had been a Guild Hunter for as long as she knew and there was nothing else she want to do but to be part of the Guild and aid the Archangel Raphael in various tasks. However on one particular hunt she was captured by a vampire who had planned the attack and been held a captive in a dark place. She was tortured, raped, fed on, beaten and hurt physically, sexually and emotionally. With help of Ashwini and Ransom from the Guild and The Seven, they find Honor and save her from the nightmare - in the process capturing only two vampires. Who had orchestrated this kidnapping and cruel game no one knows and is yet to be found. Even though she had been healed physically now, her nightmares have not stopped and neither her emotional scars abated. She had been spending all her time in the subterranean depths of the Guild Academy working through the Archives. Now Sara - the Guild Director - is sending her to The Tower on a case. Not just to anyone, but to work under / with Dmitri - the one person who had been in her fantasies, thought and mind ever since she had laid her eyes on him as a young teenager. But he is also a Vampire - the bane of her nightmares since her kidnapping. Little did she know that Dmitri had his share of nightmares that he dealt with as well. Will Honor get over her fears and nightmares at the same time working along-side Dmitri? What was done to Honor and who caused it? Who is playing this cruel cruel game? What does the tattoo on the severed head mean? Will she be immune to Dmitri's magnetic allure that he normally uses on all hunter-born to entrance them? What happened in his past that he ended up being Made? What are his nightmares? How is the tattoo connected to his past? Why is Honor having all these dreams of someone looking like Dmitri with a woman who is not her? How does Honor know things about Dmitri that he had never told anyone except Raphael - although she doesn’t seem to know that they were his deepest secrets? What is with Honor that reminds Dmitri of the long ago past that he had wanted to seal and forget? Will they be successful in both of their quests at the same time not kill each other? Another part penned well by Nalini Singh making us part of this whole family giving her visits into their life. Not a quick read as other books, but definitely a good read. And oh, don’t forget those tissues. If you are anything like me, you will cry buckets for Honor and for Dmitri. Enjoy the book. 1) A sub-plot involving Ashwini Taj - a Guild Hunter - and Janvier - smooth talking Cajun Vampire of 245 years old and works closely with Ashwini - who have been constantly playing the game of love without falling for each other. Yet! 2) Caliane - Ancient Archangel once ruled Sumeria - has come back from her sleep along with her city Amaanat and rules it now somewhere in the middle of Japan. 3) Another sub-plot involving Holly Chang - a young twenty three year old girl who was taken by Uram (An Archangel who had gone mad) during his killing rampage - who was neither fully human nor fully vampire with abilities that continually evolve. She is under protection of Dmitri and changes her name to Sorrow. 4) We get to see Archangel Neha who rules India and Archangel Favashi who rules Persia in this book again.